It has been a very exciting experience & already a number of other groups have asked for copies of the outline & planning. In Barnet after discussing the progress of the project two more schools (one primary & a linked secondary) have decided to meet up in March 2016 to plan a parallel project. They are hoping to use the SSAT student leadership accreditation. In Enfield the sessions are planned to take place in the next few weeks. Once the project has been completed I will be including comments from the pupils’ reflective diaries. From the session last week they said that they now appreciated much more how difficult planning & teaching was & they also really enjoyed being teachers themselves. They were very nervous but enjoyed the experience. The primary school pupils listened well & asked some very perceptive & challenging questions. It has been a very exciting experience & already a number of other groups have asked for copies of the outline planning. In Barnet after discussing the progress of the project two more schools (one primary & a linked secondary) have decided to meet up in March 2016 to plan a parallel project. They are hoping to use the SSAT student leadership accreditation. The students said that they now appreciated much more how difficult planning & teaching was & they also really enjoyed being teachers themselves. They were very nervous but enjoyed the experience. The primary school pupils listened well & asked some very perceptive & challenging questions. Strong links have been forged with SACRE & the participating schools & the religious communities they represent. 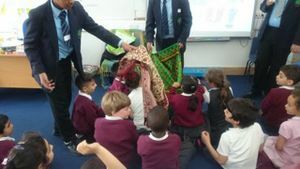 Barnet & Enfield are fortunate to have such rich resources in term of diverse faith communities & this has proved to be a positive way of celebrating & sharing the knowledge & understanding of the pupils with their linked primary schools. The framework was important as this can be widely shared after the project has been comnpleted. 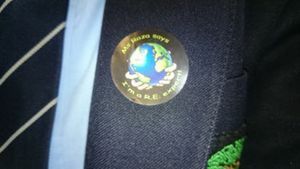 "The Faith Ambassadors delivered their presentations in a very confident manner and interacted with the children appropriately. 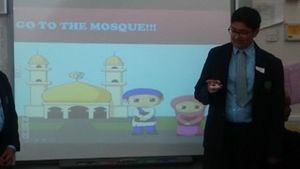 The presentations were well planned and there were opportunities for children to participate and handle artefacts. The content of the presentations was at the right level and the length and pace of the lessons was good. The children who presented worked well together. Without exception the Faith Ambassadors were knowledgeable and committed to delivering high quality, and enjoyable lessons. They answered questions appropriately and the fact that they were able to talk about what they as individuals believed and what they did in their families helped to bring RE learning to life. This I believe is a strength of the project, as well as the fact that my pupils were relating to experts not much older than themselves. Importantly my children were engaged, had fun and extended their learning."